Today it’s time for the 17th installment of Conner’s Closet!!! I can’t believe we’ve been doing this for well over a year now. Thank you Conner for all of the incredible WORK WEAR ideas that everybody gets so excited to see every month! Conner’s thoughts are in italics, and she has 3 DARLING outfits to show y’all today, so let’s get started! The print of this skirt may look familiar because Sheaffer showed the same pattern in a top a couple of weeks ago. 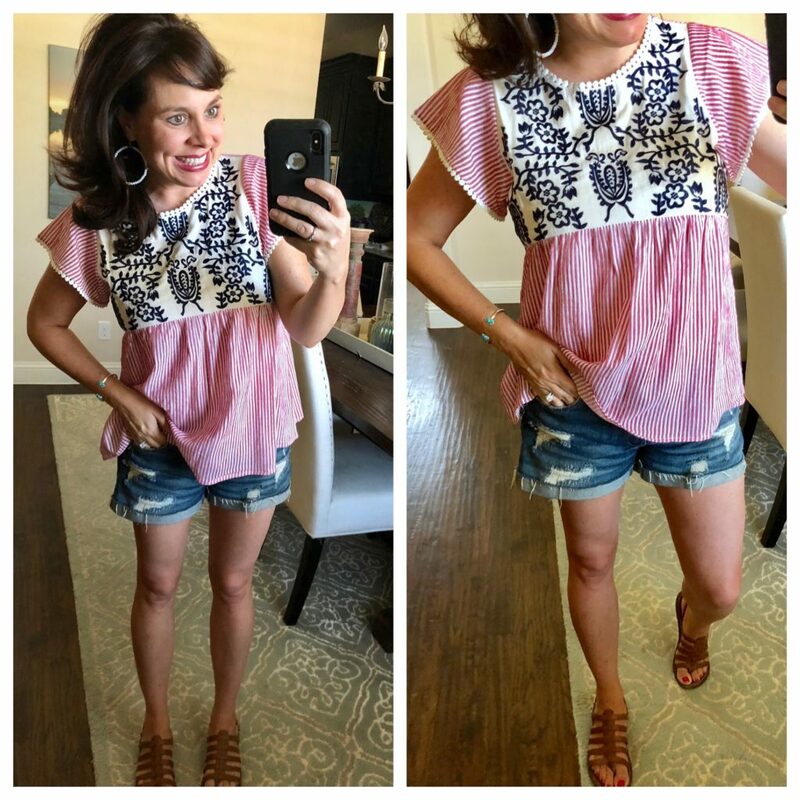 I absolutely love this outfit and it is a summertime must have! The skirt features a cinched tie waste, inverted pleat waistband, and POCKETS. Yes, pockets! The skirt sits higher on the waist which is why I decided to pair it with a fitted top. The navy Ruffle Sleeve Tee was a perfect choice! I love it and know I’ll wear it with white jeans and a chunky necklace this summer. It’s is 95% cotton and 5% spandex so it’s super comfortable. Unfortunately, the wedges I’m wearing are sold out, but Sheaffer is linking a great option that’s under $80. The skirt (00 Petite) and top (XXS Regular) are TTS. Both are machine washable. DO NOT, I repeat…DO NOT dry the skirt! I dried it for 15 minutes and a few threads came up. Please remember to lay both the skirt and top flat to dry! THIS IS PRECIOUS, CONNER! I’m a sucker for plaid. You guys. This outfit makes me swoon. Isn’t it GORGEOUS?!? I may or may not have placed it at the front of my closet just so I could admire the look. Anyway, let’s start with the lace pencil skirt. The color and details are beautiful. Just look at the waistband… isn’t it pretty?!? Green is clearly one of the hot colors for the summer. It’s everywhere! The skirt pairs perfectly with the Floral Ruched Shoulder Tie Top. There is a little bit of green in the stems of the flowers and it matches the skirt perfectly. I love this top and will also wear it with my white Loft Marisa pants from last summer. 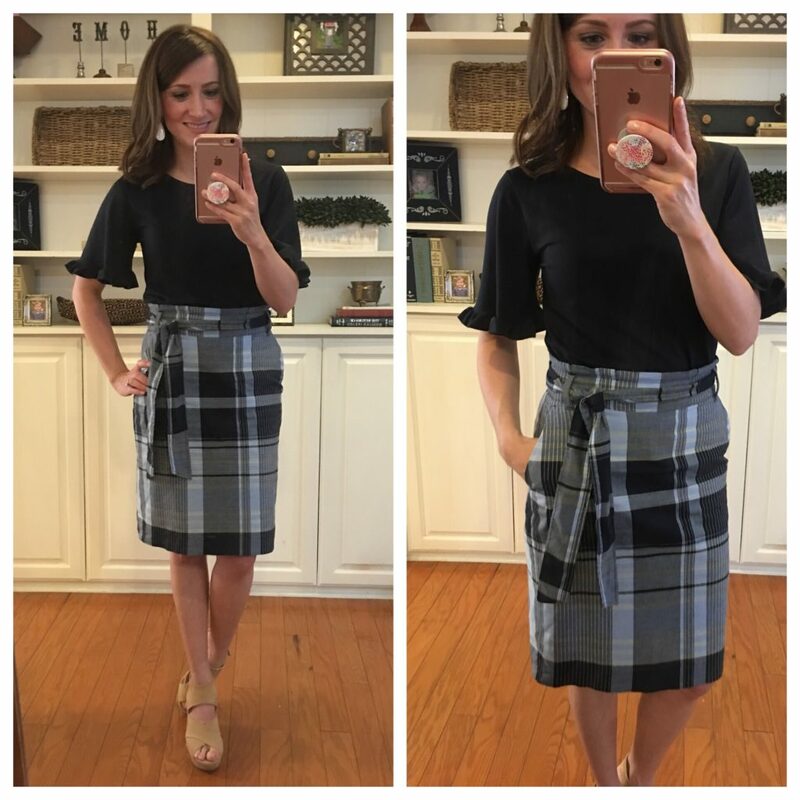 Both the skirt (00 Petite) and top (XXS Regular) are true to size. I’m wearing my Vince Camuto Corlina sandals from Nordstrom which are also TTS (5.5). The top and skirt are machine washable, but I’m going to take the skirt to the dry cleaner. Conner’s right that olive green is one of the “it” colors. I think it’s a hard color to wear on top for lots of people, but a skirt would be a great way to incorporate the color into your wardrobe! 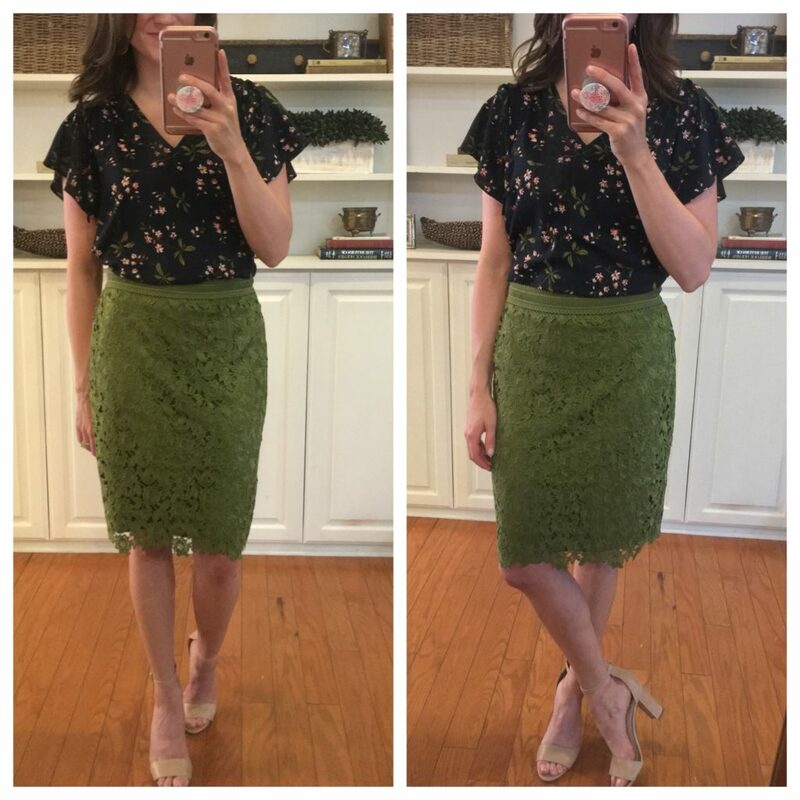 I didn’t have a white pencil skirt in my closet (and my guess is that you don’t either) which is why I decided to take a chance on this skirt – and I’m so glad I did! The floral print is very subtle and feminine. What you don’t see in the picture online is the ADORABLE black trim at the waist. It adds SO much to the whole outfit! I was planning on purchasing a short, fitted coral sweater to go with this skirt, but once I saw the black trim, I knew I had to shift my focus and find a top to tuck into the skirt. This tie sleeve top is perfect! 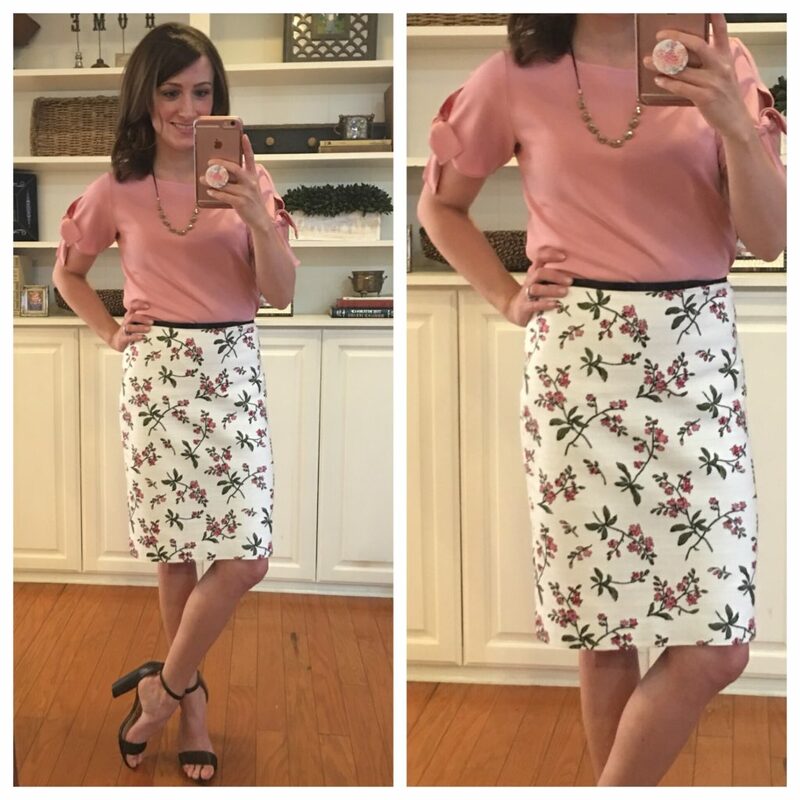 The coral color compliments the coral and light pink tones in the floral print on the skirt…plus, look at those tie sleeves! Don’t you love them? I’m wearing my go to Sam Edelman Yaro sandals from last season (true to size). The skirt (00 Petite) is true to size, but the top has more of a relaxed fit, so I sized down to an XXS Petite. Both items are machine washable and I recommend hanging them or lying flat to dry. I love this sweet combination, Conner! The tie sleeves with the floral pencil skirt look great together. And I love the colors! THANK YOU, CONNER! As always…you are absolutely DARLING in everything. This lace trim midi dress was restocked in all sizes as of last night. Fingers crossed it still is! And the pom pom bag went 40% OFF! Now, in addition to the price, I’m going to list all of the other things I love about this red summer dress (that comes in white too). First of all, IT’S LINED. Thank you dress people. I feel like this should be a prerequisite for most dresses. Second of all, the spaghetti straps (see those on the last picture of the dress) are adjustable. GENIUS. Third of all, the back panel of the bodice is smocked. Which means it’s stretchy, comfy, and has some give. Which is awesome. You can click HERE to see the original post with this dress if you want to know more about anything else in the outfit. I’m wearing a medium, and because it’s junior’s sizing a medium is a 7-9. A 7-9 in a junior’s dress is true to size for me. And I’m of course wearing my MUST HAVE strapless bra with it. Girls. This dress is awesome. I made this Father’s Day gift ideas collage two years ago…maybe even 3…and I still think the items in this collage are THE BEST gifts to give. 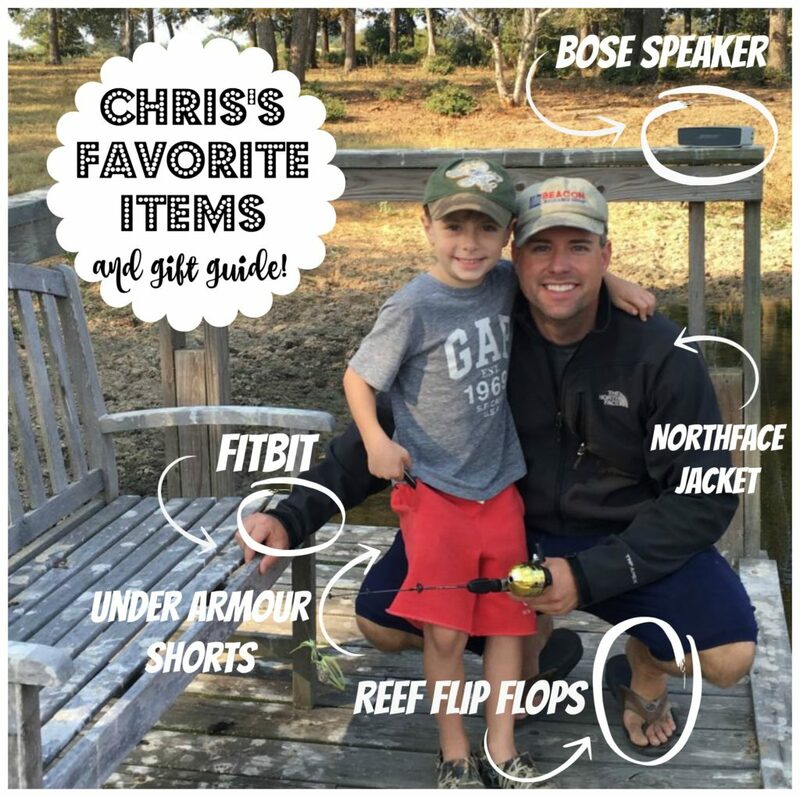 The Bose speaker is hands down the best gift I’ve ever given Chris (this $99 option has FANTASTIC reviews), and I know lots of you ladies feel the same way. If you want to be an absolute HERO on Father’s day, gift a Bose speaker. Chris uses his at the pool, at the lake, on the porch, at the neighbors, EVERYWHERE. The Reef flip flops (with the bottle opener on the bottom) are also a great gift, and they are super affordable at UNDER $60! Actually, they are ON SALE right now for $49, regularly $59.95. What a deal! You can also click HERE for a water friendly version (but they aren’t on sale). NOT PICTURED, but also HIGHLY RECOMMENDED for dads…anything YETI. Click HERE to look at hard coolers, soft side coolers, insulated cups, and tons of accessories. If you don’t know about Yeti, they are hands down the best coolers on the planet. They will keep ice for several days. It’s crazy! Chris also has a couple of Yeti tees, and they even have Yeti hats. See y’all back here on Wednesday for The Bachelorette recap! You can click HERE if you want to catch up on the first two. Okay, girls. ONE MORE THING…. We have a late addition to the party, because there’s only about 50 left, and I’m afraid if I wait until Wednesday to post it (as planned), there won’t be any left. LOOK AT THIS SHIRT. I can hardly handle the cuteness. The stripes! The embroidery! The rick rack trim around the neckline and sleeves! I LOVE IT ALL. I’ve already worn it…..and I will continue to…but you can bet your boots I’ll be wearing it on July 4th as well. And every single week of the summer. It looks cute both out and with a half tuck. I sized up to a medium in this top, but if you don’t have a large chest, I would definitely go with your regular size. I actually tried on an x-small at a local boutique, and it fit everywhere (except the chest). I actually think a small would be fine on me, but I had them send me a medium just to be safe. I of course love it with my denim shorts (size down a size if between sizes), but it’s going to be awesome with my favorite white jeans too! My sandals are 40% OFF, make sure you size up a 1/2 size. Once this top is gone, it’s gone. Don’t regret not getting it! I love waking up to you in my blog feed!! Okay, so Conner is so super cute in all three outfits…but my fave is you in the red and white with denim shorts. That is so YOU! 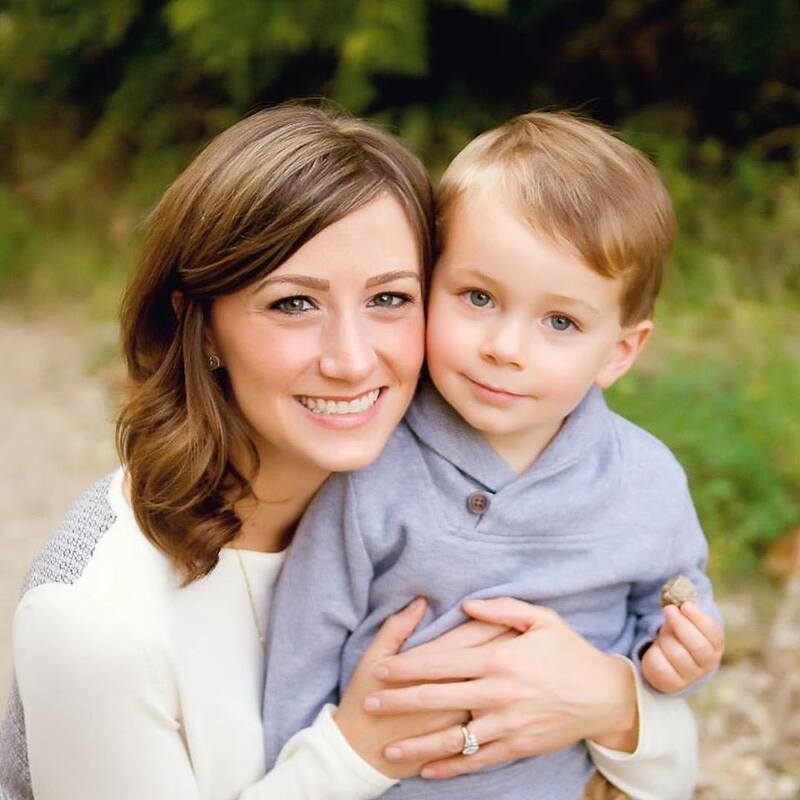 I’m pretty sure I’ve said this 16 other times but isn’t Conner the cutest?! She makes me wanna but all the pencil skirts and heels! So so cute! Sheaffer ~ That embroidered top is precious! By the way, you ALWAYS look cuter than the model pic on the websites. Most things I click on the link and think “it’s ok”, but you make it look great! Still loving your blog! Oh my goodness, that is the most adorable red top ever and it is already out of stock (as predicted)….sniff, sniff. Please keep us updated on availability or other ways of purchase. Great find!!! I purchased this same top a few weeks ago through Liz and Honey boutique! I love their stuff!! Thanks so much for the tip! Looks like it already sold out there too, but I’ll still keep looking (aka stalking in the name of fashion- HA!). 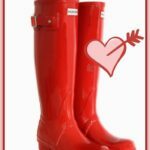 Looks like it is back in stock- woo hoo!! I have to say that the most interesting part of the work-wear posts is learning that some of these sizes even exist. XXS? 00 Petite? I had no idea.